Iran vowed today to start work immediately on drastically expanding its capacity to enrich uranium, defying the first-ever UN sanctions against the Islamic republic's nuclear programme. In a shocking disclosure, a former Chief Justice of India (CJI) today laid the blame for the mass one-day casual leave by 25 Judges of the Punjab and Haryana High Court in April 2004 at the doors of the Chief Justice of India at the time of the incident. Has the government failed in controlling the prices of essential commodities? 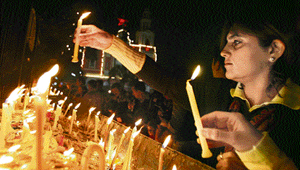 A girl lights candles on the eve of Christmas at the Sacred Heart Cathedral in New Delhi on Sunday. Anxious at the health of Trinamool Congress chief Mamata Banerjee on the 21st day of her indefinite fast in protest against the Tatas' project in Singur, Prime Minister Manmohan Singh today requested her to end her hunger strike but she refused to budge. A 15-year-old Sikh schoolboy, who had alleged that his hair were chopped off by a gang of four near his home in Edinburgh, has told the police that he concocted the story about a racist attack as he was experiencing certain personal problems. In a relief to passengers who are left stranded at airports owing to flight cancellation and delays due to technical snags, the State Consumer Commission has held that airlines operating from Delhi will have to pay a compensation of Rs 10,000 each to domestic travellers if the delay exceeded two hours. With the exception of Pondicherry, Panaji and Shillong, 60 out of 63 mission cities, including Chandigarh and Delhi have submitted their city development plans to the Union Urban Development Ministry to access Central funds under the Jawaharlal Nehru National Urban Renewal Mission. If 2005 launched Vidya Balan, then this year is definitely for Kangana Ranaut, who has emerged as one of the most promising newcomers in filmdom. When tennis ace Roger Federer was playing cricket in Cuddalore District, Collector Gagandeep Singh Bedi was rescuing bonded labourers. District Collector Gagandeep Singh Bedi listens to the woes of the labourers who were rescued recently from Koranial village in Ernakulam district.